Choose to make flight bookings. Give the departure and destination locations, the number of adults and children travelling and the date of travel. Click on the search button to obtain the list of available flights. Login to your Goibibo account. Choose the flight of your choice and make the booking. Goibibo is offering a cashback of up to Rs.20000 on international flight bookings. The cashback amount is calculated on the booking value. Give the Goibibo offer code INTSR for one-way flight booking and INTSON for round trip flight booking. The amount of discount will be applied to the total bill amount. Make the payment. If you still searching more discount offers on flight tickets then simply check MakeMyTrip flight coupons and get more discounts. The offer is available only on international flights. There is no restriction on the travel date. The offer is not available on Indigo airlines. Each user can use the code once on each booking. This offer cannot be used with other offers. The discount is applied on the bill amount and cannot be redeemed for cash. The offer is available only for online bookings. Each user can use the Goibibo promo code for international flights for three times during the offer period. Get Rs.2000 cashback with Goibibo domestic flight offers. The cashback of Rs.2000 is provided in the form of promotional goCash on all domestic flight bookings. Open the Goibibo application. Choose to make domestic flight bookings. Give the travel date, departure and destination locations, the number of adults, children and the infants travelling and the date of the return journey for round trip booking. Give the Goibibo promo code domestic flights GET2000GC and make the booking. You can get these type of offers in Cleartrip also, To check those deals visit Cleartrip Domestic Flight Offers and save more. Make the payment. The cashback amount will be given in the form of promotional goCash. Goibibo flight offers on domestic flights are valid on all domestic flight bookings. There is no restriction on minimum flight booking amount. The cashback offer is valid for both one-way and round-trip domestic flight bookings. If the customer cancels the booking, the cashback amount will also be forfeited. Cancellation charges if any has to be paid by the customer upon cancellation of the booking. The goCash earned using the Goibibo flight promo codes can be used for flight, hotel or bus bookings on Goibibo. Goibibo is offering special discounted fares on Singapore Airlines premium economy class bookings of chosen flights. The starting fare is Rs.24415 + Taxes.Login to your Goibibo account. Choose to make an international flight booking to Singapore. Choose the departure location as Delhi or Mumbai. Enter the date of journey, the return journey date for round trip booking and the number of adults, children and the infants traveling. Click on the search button to get the list of available flights. Choose the flight of your choice and proceed to make the booking. Give the Goibibo promo code for international flights INTSALE. Proceed to make the payment. Like Goibibo, Yatra also offering discount deals on International flights. To grab those discounts check Yatra International Flight Coupons and pay less on your trip. These Goibibo international flight coupons are valid only on Singapore Airlines flights. The discount offered is calculated on the base fare. The Goibibo discount coupons for international flights are valid on both round trip and one-way bookings. Each user can use the Goibibo flight booking promo code for three times during the offer period. Goibibo is not responsible if the customer gives wrong Goibibo international flight discount coupons code. Goibibo promo code for flights is not valid on payments that are made fully using the promotional goCash. Goibibo in collaboration with Jet Airway is offering a mega international flight sale offer. You can get up to 30% discount on your international flight booking to Europe/USA/Canada/ Africa/Australia. Open the Goibibo application. Choose to make an international flight booking. Choose to make one way or round trip booking. Enter the country name, departure and destination locations, date of travel, the date of return journey in case of round trip booking, and the number of adults, children and infants traveling. Click on the search option to get the list of available flights. Pick the flight of your choice. Give the Goibibo discount code GC5000 to get the cashback of Rs.5000. Make the booking and make the payment. The offer is valid only on Jet Airways flights. The maximum amount of cashback that can be obtained is limited to Rs.5000. Each user can use Goibibo Jet airways discount coupons on international flight bookings for three times during the offer period. Travel agents cannot avail the offer. Full payments made using GoCash cannot avail the offer. Goibibo is not responsible for entering a wrong coupon code. The offer will be provided only upon the availability of the seats. Choose to make an international hotel booking. Enter the city name, check-in and check-out dates, and the number of rooms required. Click on the search hotels button to get the list of available hotels. Goibibo is offering 100% cashback of up to Rs.8000 on all international hotel bookings. The cashback will be provided in the form of GoCash. Login to your Goibibo account. Select the hotel of your choice. No Goibibo hotel discount coupon is required to avail the offer. Make the booking. Choose to make the payment at the hotel. The cashback amount will be credited to your Goibibo wallet after processing of the booking request. The Goibibo book hotels offer is available on desktop and mobile sites only. The offer is available only on selected hotels in selected cities. The offer is available only on pay at hotel payment option. The maximum cashback that can be obtained is limited to Rs.8000. The Goibibo cash back offer cannot be used along with other offers. The offer is valid on all international hotel bookings without any limit on the minimum booking value. Travel agents cannot use the offer. The cashback amount will be credited to your Goibibo wallet only if the booking meets the requirements for obtaining the cashback. No Goibibo international hotel promo code is required to get the cashback. Goibibo is offering a special discount on domestic hotel bookings on Republic Day. You can get up to 65% discount and use 25% of GoCash to make the booking. Users of Goibibo mobile app can get an extra 5% discount. Open your Goibibo mobile application. Choose to make a domestic hotel booking. Give the city name, check-in and check-out dates, and the number of rooms required. Give the Goibibo promo code for hotels GOKARDE. Make the booking. Choose to make 25% of the bill value using goCash. The discount of 65% will be applied to the bill value. Make the payment. If you want more number of hotels with offers then check Oyo Rooms Hotels Coupons. They also offering various deals on hotel bookings. The offer is available only on Desktop and mobile application. The maximum amount of discount that can be obtained on bill value is limited to Rs.4000. The offer is valid only on domestic hotel bookings. The offer is not available for selected hotels. Goibibo discount coupons for hotels have to be given before making the booking. The discount amount cannot be redeemed for cash and will be applied to the bill value. Each user can use the Goibibo hotel offers for three times using the same mobile number or the mail Id. The offer is valid only from 12:00 PM to 12:00 Midnight on Republic Day. Goibibo is offering a discount of 70% on all domestic hotel bookings. Budget rooms with facilities such as free Wi-Fi, air conditioning, television, and free breakfast will be provided at the hotels. Login to your Goibibo account. Choose to make domestic hotel bookings. Give the city name, check-in and check-out dates, and the number of rooms required. Click on the select hotels button to get the list of available hotels. Select the hotel of your choice. 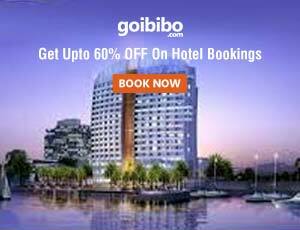 Give the Goibibo promo code for hotels GOSTAYS70 to get the 70% discount on your booking value. Make the payment. The maximum amount of discount that can be obtained is limited to Rs.1000. The discount is applied on the booking value and cannot be redeemed for cash.Like Goibibio, Hotels.com also giving discounts on domestic hotels. To get those deals check Hotels.com Domestic Hotels Coupons. The offer is valid only on domestic hotel bookings. Each user can user the offer only thrice with the same mobile number or the email ID. Only three transactions will be allowed per credit card during the offer period. Give the promo code before making the payment. The fly and stay combo offer of Goibibo lets you get premium accommodation at selected hotels for just Rs.999. Log in to your Goibibo account. Choose to make flight+hotel booking. Enter the required details such as city name, departure and destination location, hotel check-in and check-out dates, date of travel and other details essential to complete the booking process. Give the Goibibo hotel promo codes to avail the offer. Make the payment. The offer is available only for desktop and mobile applications. The discount provided on hotel bookings varies with the hotel chosen. The offer is available only on selected domestic hotels. Enter the Goibibo promo code before making the payment to get the discount. Each user can avail the offer for three times during the offer period. Travel agents cannot avail the offer. Discount will be applied on the booking value only after entering the discount code. Open your Goibibo account. Choose to make bus booking. Give the required details such as one way or round trip, date of journey, city, the return travel date in case of round trip booking, and the number of seats required. Goibibo bus booking offer is a wonderful chance for Goibibo customers to enjoy free shopping worth Rs.5000 at online stores such as eBay, Firstcry and Jabong. The offer is also valid at offline stores such as Peter England. Click on the search button to get the available options. Pick the bus of your choice and make the booking. Give the Goibibo bus promo code go5000. Make the payment. You will be given shopping coupons worth Rs.5000 that can be availed at various online stores. Give the Goibibo discount promo code go5000 at the time of making the payment to avail the offer at offline stores. The offer is valid on hotel or flight or bus booking. The discount coupons are valid only at selected stores. The maximum amount of discount that can be availed at a store is limited as per the store guidelines. Book your bus ticket with Goibibo and travel for free. Goibibo is offering 100% cashback on all bus bookings. Open the Goibibo application or the Goibibo website. Log into your account. Choose to make the bus booking. Select the one way or round trip option. Give the details such as city, destination and departure locations, date of travel, the date of a return journey for round trip booking and the number of seats required. Click on the search button to get the available options. Choose the bus of your choice and make the booking. No Goibibo promo codes for bus booking are required to avail the offer. If you’re not satisfied with these offers you can check RedBus Coupons and save more. Make the payment. The cashback amount will be credited to your Goibibo account in the form of goCash. 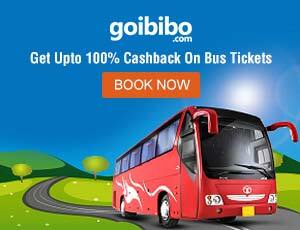 The maximum amount of cashback that can be obtained through Goibibo bus offers is limited to Rs.1000. Each user can use the Goibibo promo code bus only once in 24 hours. The maximum amount of discount that can be obtained per transaction is limited to 10% of the booking value or Rs.100 whichever is lower. The promotional goCash earned through Goibibo discount coupon for bus booking has a validity of 90 days. The goCash can be used to make the online bus, flight or hotel bookings at Goibibo. If the customer cancels the bus booking, the cashback amount will also be cancelled. The promotional goCash used at the time of making the bookings will be credited back to the account if the customer cancels the booking. Using the Goibibo application, travelers can search for the hotel, bus, flight or holiday packages of their choice. They can make domestic and international hotel and flight booking, and domestic bus booking. It also offers best domestic and international holiday packages at discounted price. Goibibo has recently launched “ibibo Ryde” the carpooling app to help travelers manage their daily shuttle to the workplace. It provides great discounts on all of its services. The app is free to download for Google Play Store, ios app store and Windows. Check here for Goibibo latest offers. The mobile application users can obtain the Goibibo latest promo codes to their registered mobile number. The Goibibo refer and earn offer gives you an opportunity to get great deals. Get a free one-night stay at a hotel and goCash worth Rs.1000. Your friend will also get goCash worth Rs.2000 upon downloading the app.Login to your Goibibo account. Refer a friend by sending the referral code provided in your account. You will get free one night stay at a hotel and GoCash of Rs.1000 when your friend downloads the application using your referral code. The moment your friend completes the download process you will be sent a promotional code that can be used on your next domestic hotel booking to avail the free one-night stay offer. The promotional GoCash earned through the offer can be used for hotel, bus or flight bookings. The offer is valid only on domestic hotel bookings. The free one night stay at the chosen hotel will be provided only for the first referral. Customers can refer as many friends as they wish. The maximum amount of discount that can be availed on hotel rooms is limited to Rs.1000. The maximum amount of goCash your friend can earn under the Goibibo signup offer is limited to Rs.2000. You can also get 10% of the first booking value made by your friend – a maximum of Rs.500 will be provided for bookings made using the mobile app and Rs.100 for bookings made using the desktop application. The holiday package expenses include return economy class airfare to Delhi from Dubai, accommodation for 3 nights in Dubai, daily breakfast at the hotel you stay, two-way transfer to Dubai airport, half day Dubai city tour, Desert safari, Dhow Cruise dinner, and UAE single entry tourist visa and boarding charges. Goibibo is offering 3 Nights/4 Days Dubai international holiday package for just Rs.40672 per person. Book the holiday package and enjoy the Dubai shopping festival. The city tour covers Burj Al Arab, Jumeriah Mosque, Dubai Museum and shopping at Gold Souk. It is very easy to book the package. Login to your account. Choose to make a booking for international holiday package for Dubai. Make the payment. The itinerary will be sent to your registered email ID. The accommodation is provided on twin sharing basis. Customers have to pay for early check-in and late check-out of hotel accommodation. The hotel price or the tour price is subject to change. The booking process is initiated only after receiving the amount. The tour cost is quoted as per the rate of exchange at the time of booking. Kerala, well known for its pristine beauty and wonderful waterfalls and backwaters is one of the most visited tourist spots in India. Goibibo is offering Kerala domestic holiday package from Rs.15581. During the tour, you can visit Munnar, Eravikulam National Park, Mattupetty Dam, Tata Tea Museum, Alleppey backwaters and Kumarakom shopping center. The tour cost includes airport transportation charges, hotel accommodation, and meals at hotels and resorts. The charges do not include airfare, train fare, medical travel insurance, personal expenses, government taxes, and other transportation charges that are not included in the itinerary. You can find these type of holiday packages deals in Yatra also, To grab those discounts check Yatra Offers and enjoy the holiday trip. Open your Goibibo account page. Choose to make a booking for a domestic holiday package. Pick the Kerala, Munnar 2 nights and 3 days package. Enter the required travel details. Make the booking and make the payment.The price quoted is for a single person on twin sharing basis. If accommodation at the chosen hotel is not available then accommodation will be provided at same category hotel. The listed package rate is not applicable during festivals, long weekends, New Year, Christmas and national holidays. The package cannot be combined with other offers. Goibibo reserves the right to change the package price at any time without any prior notice. To make it easy for the customers to manage payments and refunds easily, Goibibo has introduced goCash wallet in 2014. It provides multiple payment options – net banking, credit or debit card and by using the goCash wallet. Goibibo is rewarded as the Best Website award in the Leisure and Travel Category by Website of the Year India (WOTY) in 2014. The company working with the mission to provide fastest and high-quality services to the customers has reported 5x times growth in hotel bookings in 2015. Goibibo provides the goCash wallet in which the travelers can save money to make instant bookings with Goibibo from anywhere anytime. Two types of goCash are available, promotional GoCash and the non-promotional goCash. Customers can earn Promotional goCash by participating in cashback and other rewards programs of Goibibo. The non-promotional goCash is earned by cancellation of the bookings that are paid using net banking, credit or debit cards. The promotional goCash has the validity of 90 days from the date of credit. The non-promotional goCash does not have an expiry date and usage conditions. Book your flight, car or hotel booking with Goibibo and get Zoomcar voucher worth Rs.1000. The voucher can be used on all drives. Login to your Goibibo account. Choose to make the bus, flight or hotel bookings. Enter the details required for making the booking. Give the coupon code GO5000 to avail the Zoomcar offer. The discount voucher will be sent to your registered email ID after processing the order. In the future Goibibo linking with Uber Cabs and Ola Cabs and they will offer more deals on cabs. The offer is valid on all drives. The offer is valid only for bookings made from Monday to Thursday. The minimum booking value has to be Rs.3500. The Zoomcar discount voucher is applicable only to original reservations and cannot be used on excess Km, late fee, and other charges. The offer is available in all cities. The voucher can be used only for bookings made at Zoomcar website and iOS/Android app. Goibibo.com, the hotel booking application, was launched in the year 2009. The application was groomed in later years to include flight, holiday packages and bus bookings. It is the first Indian OTA to collaborate with Google Flight Search service. Goibibo app enables customers to manage their travel bookings on the go. The application is simple, easy and secure to use. It provides multiple payment options such as net banking, credit or debit card payments that are safe and secure. The goCash wallet is a safe way to make the payments instantly anytime without any hassles. Goibibo provides simple refund policy giving customers the freedom to cancel the bookings anytime before the travel date. 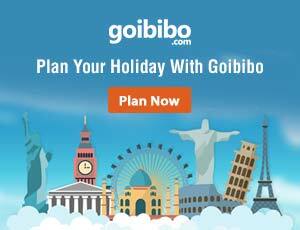 Goibibo offers and discount coupons save on your travel bookings. Few offers are so amazing that the customers can get 100% cashback as goCash. Check this site to know about Goibibo latest offers and deals. Goibibo.com launched in the year 2009 by the ibibo Group is one of India’s largest online travel service providers. The application that was initially launched as a hotel booking application was developed to include flight and bus booking by 2011. Goibibo.com is the first Indian OTA to collaborate with Google Flight Search service. The Goibibo app enables customers to avail the Goibibo services on the go. It has developed a separate application for iOS, Blackberry and Windows Phone users. Goibibo app for Blackberry, Goibibo app for Windows Phone and Goibibo iOS app can be downloaded for free from Google Play Store, Windows Store and the Apple app store. Thanks For Sharing A Nice Information! Every Time I’m Using Goibibo For Tickets & Hotels Bookings.